Do your kids like donuts, superheroes and ships? 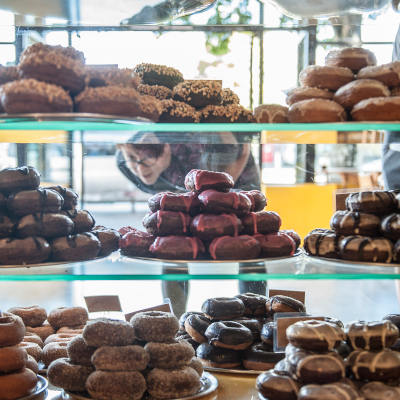 Then put on your capes and sail on over to Ballard this weekend for the opening of the spacious, nautical-themed Mighty-O Donut shop, located on at the corner of N.W. Market St. and 17th Ave. N.W. For Mighty-O newbies, here's the backstory: Kellner started Mighty-O Donuts in 2000 as an organic, from-scratch donut business that originally sold at farmers markets and festivals. "I was looking for a simple model for a business that people could relate to," he says. In 2003, he opened the first Mighty-O shop in Wallingford's Tangletown neighborhood, on N. 55th St. The Ballard shop — Mighty-O's second retail location — is designed with the neighborhood's seafaring and industrial history in mind: Kids will love the large, colorful paintings of scenes such as a tugboat or a slicker-clad sea captain. They can also look through portholes at the donut-making machine (get there early, though; donuts are made until about 10 a.m.). 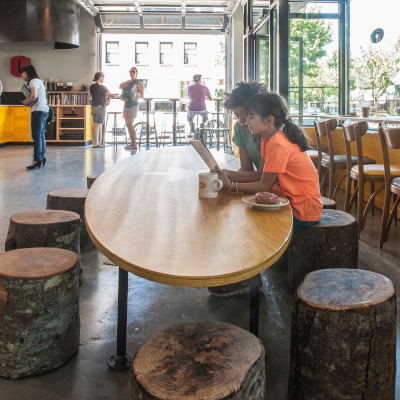 There is a large kid-size table in the center of the 2,500 square-foot space, with stumps as chairs, a nearby shelf of kids' books and plenty of room to move. The cafe seats 50 inside and 8–16 outside (though parents of small kids should beware, as the shop is on busy N.W. Market Street). Oh, and the donuts? As at the Wallingford store, they're made in house (hence, the portholes), with flavors ranging from classic (naked, glazed chocolate) to creative (French toast, lemon poppy, coffee bomb, cocoloco). Though it's a stretch to say that Mighty-O's donuts are healthy, its practices do promote a healthy environment, from using only certified-organic ingredients and no animal or GMO products in its donuts to a zero-waste ethic, such as using flour bags for compost trash bags. All the mixes and glazes are made from scratch at a Mighty-O facility in South Seattle. Fun fact: Mighty-O makes and sells about 950 donuts a day, though on National Donut Day (June 3) it sold about 3,500. Expect further expansion news soon. Mighty-O will open another retail shop on Capitol Hill in September, in the former location of High 5 Pie. Kellner — who is a dad of two kids, and whose wife also helps in the business — agrees that the experience of opening two stores almost simultaneously is akin to having twins. "It all happened at once," he says. When: Hours are Monday through Friday, 6 a.m.–6 p.m.; Saturday and Sunday, 7 a.m.–6 p.m. Grand-opening events are Friday–Sunday, Aug. 14–16. Mighty-O tips: There is wifi at both stores, and you can find on-street metered parking for four hours. Ballard tips: Consider combinining with a trip to other Ballard highlights, such as the Ballard Commons park and fountain; the wonderful Ballard public library of the Ballard farmers market, held every Sunday.